The world’s first-ever railway suspension bridge was built over the Niagara River, connecting Ontario to New York. The builder? John Augustus Roebling, who later got the credit for building the Brooklyn Bridge even though his daughter Emily really got it done. There is a giant statue of Nikola Tesla, a gift from the country formerly known as Yugoslavia, celebrating the site where he built the first hydro-electric power plant, giving us electricity. The first couple to honeymoon at Niagara was the daughter of Aaron Burr, Theodosia Burr Alston. (Okay, that one belongs to Lin Manuel-Miranda but we’re here for it). Always a sucker for an elaborate regal title, I had to know more. Annie Edson Taylor was born in upstate New York, and worked as a schoolteacher before life dealt her some tough blows: she lost her infant son, and then her husband was killed in the Civil War. But Taylor was a self-starter. The young widow and bereaved mother traveled around looking for teaching jobs, taking on a nomadic lifestyle. Like so many late 19th-century Americans, she headed West, opening a dance studio in Bay City, Michigan and then hopping to San Antonio, Texas to try to find work. This kind of life was rough financially, but she never lost her dream of making money and attaining the comfortable life that so far had eluded her. 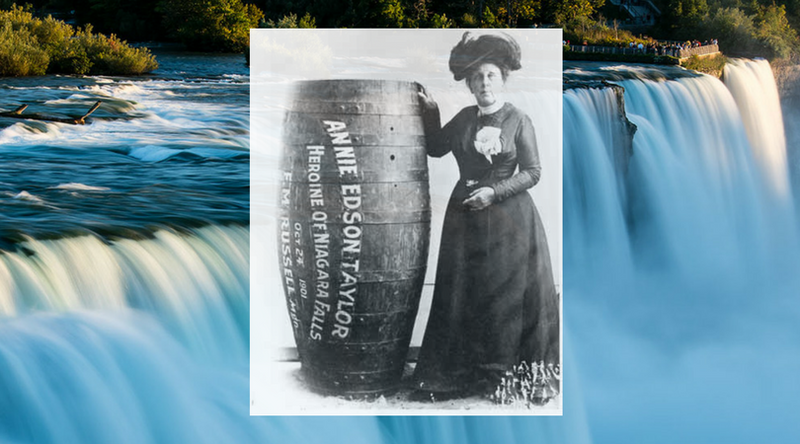 In her 60s, with little to her name, she crafted a plan: she would go over Niagara Falls in a barrel, a daredevil stunt that would make her famous – and rich. She planned her barrel-roll to coincide with the 1901 Pan-American Exhibition, a World Fair in the area that would gather massive crowds. She marketed herself as a fearless 43-year-old who would defy death in a public setting, and planned to capitalize on the fame afterwards for cash. The next day, October 24, 1901, thousands gathered to watch Taylor’s attempt. Taylor climbed in her five-foot barrel, a couple of dudes in a rowboat got her in the right place, and off she went over the thundering whitewater, a terrifying 188-foot drop. It took 20 excruciating minutes for the barrel to complete its journey into the falls, down the drop and out of the whirlpool rapids at the bottom. Once the barrel was in calmer waters, a rescue team scooped the barrel out of the water and – scared of finding a dead woman inside – hemmed and hawed for quite a while before finally opening it to reveal… a living, breathing Taylor, fine except for a cut on her head. You can achieve anything you set your mind to (or are totally desperate to achieve)! Well, sort of. Taylor survived her barrel role and amassed a small amount of fame, but she never made much money off of her crazy stunt for two reasons. First, her manager took the barrel following the stunt and toured it around the United States for paid appearances that she never saw a dime of (classic). Second, because the appearances and performances she did get, kind of floundered. Why did they flounder? Partly to blame is Martha Wagenfuhrer. Ladies! Strong women lift each other up, not tear each other down!